In the earliest historical times, the term Assyria ( Syriac: ܐܬܘܖ̈) referred to a region on the Upper Tigris river, named for its original capital, the ancient city of Assur. Later, as a nation and Empire, it also came to include roughly the northern half of Mesopotamia (the southern half being Babylonia), with Nineveh as its capital. Assyria proper was located in a mountainous region, extending along the Tigris as far as the high Gordiaean or Carduchian mountain range of Armenia, known as the "Mountains of Ashur". The Assyrian kings controlled a large kingdom at three different times in history. These are called the Old, Middle, and Neo-Assyrian kingdoms, or periods. The most powerful and best-known nation of these periods is the Neo-Assyrian kingdom, 911-612 BC. The most important prehistoric ( Neolithic) site in Assyria is at Tell Hassuna, the centre of the Hassuna culture. Of the early history of the kingdom of Assyria, little is positively known. According to some Judeo-Christian traditions, the city of Ashur (also spelled Assur or Aššur) was founded by Ashur the son of Shem, who was deified by later generations as the city's patron god. The upper Tigris River valley seems to have been ruled by Sumer, Akkad, and northern Babylonia in its earliest stages; once a part of Sargon the Great's empire, it was destroyed by barbarians in the Gutian period, then rebuilt, and ended up being governed as part of the Empire of the 3rd dynasty of Ur. The first inscriptions of Assyrian rulers appear after 2000 BC. Assyria then consisted of a number of city states and small Semitic kingdoms. The foundation of the Assyrian monarchy was traditionally ascribed to Zulilu, who is said to have lived after Bel-kap-kapu (Bel-kapkapi or Belkabi, ca. 1900 BC), the ancestor of Shalmaneser I. The city-state of Ashur had extensive contact with cities on the Anatolian plateau. The Assyrians established "merchant colonies" in Cappadocia, e.g., at Kanesh (modern Kültepe) circa 1920 BC– 1840 BC and 1798 BC– 1740 BC. These colonies, called karum, the Akkadian word for 'port', were attached to Anatolian cities, but physically separate, and had special tax status. They must have arisen from a long tradition of trade between Ashur and the Anatolian cities, but no archaeological or written records show this. The trade consisted of metal (perhaps lead or tin; the terminology here is not entirely clear) and textiles from Assyria, that were traded for precious metals in Anatolia. The city of Ashur was conquered by Shamshi-Adad I ( 1813 BC– 1791 BC) in the expansion of Amorite tribes from the Khabur river delta. He put his son Ishme-Dagan on the throne of nearby city Ekallatum, and allowed the former Anatolian trade to continue. Shamshi-Adad I also conquered the kingdom of Mari on the Euphrates and put another of his sons, Yasmah-Adad on the throne there. Shamshi-Adad's kingdom now encompassed the whole of northern Mesopotamia. He himself resided in a new capital city founded in the Khabur valley, called Shubat-Enlil. Ishme-Dagan inherited the kingdom, but Yasmah-Adad was overthrown and Mari was lost. The new king of Mari allied himself with Hammurabi of Babylon. Assyria now faced the rising power of Babylon in the south. Ishme-Dagan responded by making an alliance with the enemies of Babylon, and the power struggle continued for decades. Hammurabi eventually prevailed over Ishme-Dagan, and conquered Ashur for Babylon. With Hammurabi, the various karum in Anatolia ceased trade activity — probably because the goods of Assyria were now being traded with the Babylonians' partners. Assyria was ruled by vassal kings dependent on the Babylonians for a century. After Babylon fell to the Kassites, the Hurrians dominated the northern region, including Ashur. In the 15th century BC, Saushtatar, king of "Hanilgalbat" (Hurrians of Mitanni), sacked Ashur and made Assyria a vassal. Assyria paid tribute to Hanilgalbat until Mitanni power collapsed from Hittite pressure, enabling Ashur-uballit I ( 1365 BC– 1330 BC), to again make Assyria an independent and conquering power at the expense of Babylonia; and a time came when the Kassite king in Babylon was glad to marry the daughter of Ashur-uballit, whose letters to Akhenaten of Egypt form part of the Amarna letters. This marriage led to disastrous results, as the Kassite faction at court murdered the Babylonian king and placed a pretender on the throne. Assur-uballit promptly marched into Babylonia and avenged his son-in-law, making Kurigalzu of the royal line king there. Hanilgalbat was finally conquered under Adad-nirari I, who described himself as a "Great-King" (Sharru rabû) in letters to the Hittite rulers. Adad-nirari I's successor, Shalmaneser I (c. 1300 BC), threw off the pretense of Babylonian suzerainty, made Calah his capital, and followed up on expansion to the northwest, mainly at the expense of the Hittites, reaching as far as Carchemish and beyond. Shalmaneser's son and successor, Tukulti-Ninurta I, deposed Kadashman-Buriash of Babylon and ruled there himself as king for seven years, taking on the old title "king of Sumer and Akkad". Following this, Babylon revolted against Tukulti-Ninurta, and later even made Assyria tributary during the reigns of the Babylonian kings Melishipak II and Marduk-apal-iddin I, another weak period for Assyria. As the Hittite empire collapsed from onslaught of the Phrygians (called Mushki in Assyrian annals), Babylon and Assyria began to vie for Amorite regions, formerly under firm Hittite control. The Assyrian king Ashur-resh-ishi I defeated Nebuchadnezzar I of Babylon in a battle, when their forces encountered one another in this region. Ashur-resh-ishi's son, Tiglath-Pileser I, may be regarded as the founder of the first Assyrian empire. In 1120 BC, he crossed the Euphrates, capturing Carchemish, defeated the Mushki and the remnants of the Hittites—even claiming to reach the Black Sea—and advanced to the Mediterranean, subjugating Phoenicia, where he hunted wild bulls. He also marched into Babylon twice, assuming the old title "King of Sumer and Akkad", although he was unable to depose the actual king in Babylonia, where the old Kassite dynasty had now succumbed to an Elamite one. Assyria had difficulties with keeping the trade routes open. Unlike the situation in the Old Assyrian period, the Anatolian metal trade was effectively dominated by the Hittites and the Hurrians. They also controlled the Mediterranean ports while the Kassites controlled the river route south to the Persian Gulf. The Middle Assyrian kingdom was well organized and in the firm control of the king. The king also functioned as the High Priest of Ashur, the state god. He had certain obligations to fulfill in the cult, and had to provide resources for the temples. The priesthood became a major power in Assyrian society. Conflicts with the priesthood were probably behind the murder of king Tukulti-Ninurta I. The population of Assyria was rather small, and the main cities were Ashur, Kalhu and Nineveh, all situated in the Tigris river valley. All free male citizens were obliged to serve in the army for a time; this system was called the ilku-service. The Assyrian law code was compiled during this period. They are notable for a repressive attitude towards women in their society. After Tiglath-Pileser I, the Assyrians were in decline for nearly two centuries, a time of weak and ineffective rulers, wars with neighboring Urartu, and encroachments by Aramaean nomads. This long period of weakness ended with the accession in 911 BC of Adad-nirari II. He firmly subjugated the areas previously under nominal Assyrian vassalage, deporting populations in the north to far-off places. Apart from pushing the boundary with Babylonia slightly southward, he did not engage in actual expansion, and the borders of the empire he consolidated reached only as far west as the Khabur. He was succeeded by Tukulti-Ninurta II, who made some gains in the north during his short reign. The next king, Ashurnasirpal II ( 883 BC– 858 BC), embarked on a vast program of merciless expansion, first terrorizing the peoples to the north as far as Nairi, then conquering the Aramaeans between the Khabur and the Euphrates. His harshness prompted a revolt that was crushed decisively in a pitched, two-day battle. Following this victory, he advanced without opposition as far as the Mediterranean and exacted tribute from Phoenicia. Unlike any before, the Assyrians began boasting in their ruthlessness around this time. Ashurnasirpal II also moved his capital to the city of Kalhu ( Nimrud). The palaces, temples and other buildings raised by him bear witness to a considerable development of wealth and art. Ashurnasirpal's son, Shalmaneser III (858 BC– 823 BC), had a long reign of 34 years, when the Assyrian capital was converted into an armed camp. Each year the Assyrian armies marched out of it to plunder and destroy. Babylon was occupied, and Babylonia reduced to vassalage. He fought against Urartu, and marched an army against an alliance of Syrian states headed by Benhadad of Damascus, and including Ahab, king of Israel, at the Battle of Qarqar in ( 854 BC). 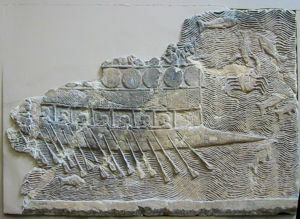 Despite Shalmaneser's description of 'vanquishing the opposition', it seems that the battle ended in a deadlock, as the Assyrian forces were withdrawn soon afterwards. Shalmaneser retook Carchemish in 849 BC, and in 841 BC marched an army against Hazael, King of Damascus, besieging and taking that city. He also brought under tribute Jehu of Israel, Tyre, and Sidon. His black obelisk, discovered at Kalhu, records many military exploits of his reign. The last few years of his life were disturbed by the rebellion of his eldest son that nearly proved fatal. Assur, Arbela and other places joined the pretender, and the revolt was quashed with difficulty by Shamshi-Adad V, Shalmaneser's second son, who soon afterwards succeeded him (824 BC). In the following century, Assyria again experienced a relative decline, owing to weaker rulers (including Queen Semiramis) and a resurgence in expansion by Urartu. 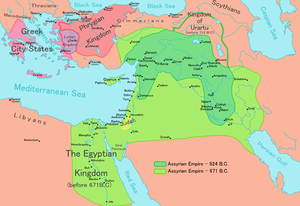 The notable exception was Adad-nirari III ( 810 BC– 782 BC), who captured Damascus in 804, bringing Syria under tribute as far south as Samaria and Edom, and who advanced against the Medes, perhaps even penetrating to the Caspian Sea. When Nabonassar began the neo-Babylonian dynasty in 747 BC Assyria was in the throes of a revolution. Civil war and pestilence were devastating the country, and its northern provinces had been wrested from it by Urartu. In 746 BC Kalhu joined the rebels, and on the 13th of Iyyar in the following year, a general named Pulu, who took the name of Tiglath-pileser III, seized the crown, and made sweeping changes to the Assyrian government, considerably improving its efficiency and security. The conquered provinces were organized under an elaborate bureaucracy, with the king at the head — each district paying a fixed tribute and providing a military contingent. The Assyrian forces at this time became a standing army, that by successive improvements became an irresistible fighting machine; and Assyrian policy was henceforth directed toward reducing the whole civilized world into a single empire, throwing its trade and wealth into Assyrian hands. These changes are often identified as the beginning of the "Second Assyrian Empire". When Tiglath-Pileser III had ascended the throne of Assyria, he went down to Babylonia and abducted the gods of Šapazza; the Assyrian-Babylonian Chronicle informs us (ABC 1 Col.1:5). After subjecting Babylon to tribute, severely punishing Urartu, and defeating the Medes and Hittites, Tiglath-Pileser III directed his armies into Syria, which had regained its independence, and the commercially successful Mediterranean seaports of Phoenicia. He took Arpad near Aleppo in 740 BC after a siege of three years, and reduced Hamath. Azariah (Uzziah) had been an ally of the king of Hamath, and thus was compelled by Tiglath-Pileser to do him homage and pay yearly tribute. In 738 BC, in the reign of Menahem, king of Israel, Tiglath-Pileser III occupied Philistia and invaded Israel, imposing on it a heavy tribute (2 Kings 15:19). Ahaz, king of Judah, engaged in a war against Israel and Syria, appealed for help to this Assyrian king by means of a present of gold and silver (2 Kings 16:8); he accordingly "marched against Damascus, defeated and put Rezin to death, and besieged the city itself." Leaving part of his army to continue the siege, he advanced, ravaging with fire and sword the province east of the Jordan, Philistia, and Samaria; and in 732 BC took Damascus, deporting its inhabitants to Assyria. In 729 BC, Tiglath-Pileser III, went to Babylonian and captured Nabu-mukin-zeri, the king of Babylon (ABC 1 Col.1:21). He had himself crowned as "King Pul of Babylon". Tiglath-Pileser III died in 727 BC, and was succeeded by Shalmaneser V, who reorganized the Empire into provinces, replacing troublesome vassal kings with Assyrian governors. However, King Hoshea of Israel suspended paying tribute, and allied himself with Egypt against Assyria in 725 BC. This led Shalmaneser to invade Syria (2 Kings 17:5) and besiege Samaria (capital city of Israel) for three years. Shalmaneser ravaged Samaria, the capital of Israel (ABC 1 Col.1:27). Shalmaneser V died suddenly in 722 BC while laying siege to Samaria, and the throne was seized by Sargon, the Tartan (commander-in-chief of the army), who then quickly took Samaria, effectively ending the northern Kingdom of Israel and carrying 27,000 people away into captivity into the Israelite Diaspora. (2 Kings 17:1–6, 24; 18:7, 9). He also overran Judah, and besieged Jerusalem (Isa. 10:6, 12, 22, 24, 34), but did not capture it. Sargon II waged war in his second year against the king of Elam, Humban-Nikaš, who allied himself with Marduk-apla-iddina of Babylon, but was defeated as told in ABC 1 Col.1:31-37. In 721 BC, Babylon threw off the rule of the Assyrians, under the powerful Chaldean prince Merodach-baladan (2 Kings 20:12), and Sargon, unable to contain the revolt, turned his attention again to Urartu and Syria, taking Carchemish in 717, as well as the Medes, penetrating the Iranian Plateau as far as Mt. Bikni and building several fortresses. Assyria was belligerent towards Babylonia for ten years while Marduk-apla-iddina ruled Babylon (ABC 1 Col.1:41-42). In 710 BC, Sargon attacked Babylonia and defeated Marduk-apla-iddina, who fled to his allies in Elam (ABC 1 Col.2:1-3). Sargon also built a new capital at Dur Sharrukin ("Sargon's City") near Nineveh, with all the tribute Assyria had collected from various nations. In 705 BC, Sargon was slain while fighting the Cimmerians, and was succeeded by his son Sennacherib (2 Kings 18:13; 19:37; Isa. 7:17, 18), who moved the capital to Nineveh and made the deported peoples work on improving Nineveh's system of irrigation canals. In 701 BC, Hezekiah of Judah formed an alliance with Egypt against Assyria, so Sennacherib accordingly marched toward Jerusalem, destroying 46 villages in his path. This is graphically described in Isaiah 10; exactly what happened next is unclear (the Bible says an Angel of the Lord smote the Assyrian army at Jerusalem; Sennacherib's account says Judah paid him tribute and he left); however what is certain is that Sennacherib failed to capture Jerusalem. Marduk-apla-iddina had returned to Babylonia during the reign of Sennacherib. The Assyrian king made battle with him in 703 BC outside Kish and defeated him. Sennacherib plundered Babylonia and pursued Marduk-apla-iddina through the land. At his return to Assyria Sennacherib installed Bel-ibni as king of Babylon (ABC 1 Col.2:12-23). Bel-ibni however committed hostilities, so Sennacherib returned to Babylon in 700 BC and captured him and his officers. Sennacherib instead installed his son Aššur-nadin-šumi on the throne of Babylon (ABC 1 Col.2:26-31). Sennacherib launched a campaign against Elam in 694 BC and ravaged the land. In retaliation the king of Elam ordered to attack Babylonia. Aššur-nadin-šumi was captured and brought back to Elam and a new king called Nergal-ušezib was installed as ruler of Babylon (ABC 1 Col.2:36-45). The Assyrians returned the next year to Babylonia and plundered the gods of Uruk. Nergal-ušezib did battle against the army of Assyria, but was taken prisoner and transported to Assyria (ABC 1 Col.2:46- Col.3:6). Another native ruler, called Mušezib-Marduk, soon seized the throne of Babylon. He held it with help of his Elamite allies for four years until 689 BC, when the Assyrians retook the city (ABC 1 Col.3:13-24). Sennacherib responded swiftly by opening the canals around Babylon and flooding the outside of the city until it became a swamp, resulting in its destruction, and its inhabitants were scattered. In 681 BC, Sennacherib was murdered, most likely by one of his sons (according to 2 Kings 19:37, while praying to the god Nisroch, he was killed by two of his sons, Adramalech and Sharezer, and both of these sons subsequently fled to Armenia; repeated in Isaiah 37:38 and alluded to in 2 Chronicles 32:21). Sennacherib was succeeded by his son Esarhaddon (Ashur-aha-iddina), who had been governor of Babylonia, and was campaigning in Urartu at the time of his father's murder, where he won a victory at Malatia (Milid). During the first year of Esarhaddon, a rebellion broke out in the south of Babylonia. Nabu-zer-kitti-lišir, a governor of the mat Tamti, laid siege to Ur. This governor did not capture the city, but fled to his kinsmen in Elam (Hal-Tamti); however, "the king of Elam took him prisoner and put him to the sword" (ABC 1 Col.3:39-42); also in (ABC 14 vs.1-4). As king of Assyria, Esarhaddon immediately had Babylon rebuilt, and made it his capital. Defeating the Cimmerians and Medes (again penetrating to Mt. Bikni), but unable to maintain order in these areas, he turned his attention westward to Phoenicia—now allying itself with Egypt against him—and sacked Sidon in 677 BC. He also captured Manasseh of Judah and kept him prisoner for some time in Babylon (2 Chronicles 33:11). Having had enough of Egyptian meddling, Esarhaddon attempted to conquer Egypt in 673 BC, but was defeated (ABC 1 Col.4:16). Two years later he made a new attempt and was successful. The Babylonian Chronicle retells how Egypt "was sacked and its gods were abducted" (ABC 1 Col.4:25); also in ABC 14 vs.28-29. 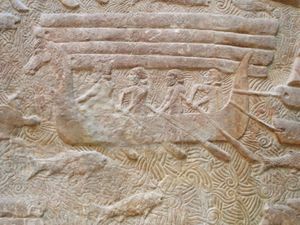 The pharaoh Tirhakah fled Egypt, and a stele commemorating the victory, and representing Tirhakah with black African features, was set up at Sinjirli (north of the Gulf of Antioch), and is now in the Berlin Museum. Assyria was also at war with Urartu and Dilmun at this time. This was Assyria's greatest territorial extent. However, the Assyrian governors Esarhaddon had appointed over Egypt were obliged to flee the restive populace, so a new campaign was launched by Esarhaddon in 669 BC. He became ill on the way and died. His son Šamaš-šuma-ukin became king of Babylon and his son Aššur-bani-pal became king of Assyria; see ABC 1 Col.4:30-33 and ABC 14 vs.31-32, 37. Bel and the gods of Babylonia returned from their exile in Assur to Babylon in the first year of Šamaš-šuma-ukin, and the akitu festival could be celebrated for the first time in twenty years; ABC 1 14 vs.34-39 and ABC 1 Col.4:34-36. Assur-bani-pal or Ashurbanipal (Ashurbanapli, Asnappar), the son of Esarhaddon, succeeded him. He continued to campaign in Egypt, when not distracted by pressures from the Medes to the east, and Cimmerians to the north of Assyria. Unable to contain Egypt, he installed Psammetichus as a vassal king in 663 BC. However, after Gyges of Lydia's appeal for Assyrian help against the Cimmerians was rejected, Lydian mercenaries were sent to Psammetichus. By 652 BC, this vassal king was strong enough to declare outright independence from Assyria with impunity, especially as Ashurbanipal's older brother, Shamash-shum-ukin, governor of Babylon, began a civil war in that year. This rebellion lasted until 648 BC, when Babylon was sacked, and Shamash-shum-ukin set fire to the palace, killing himself. Elam was completely devastated in 646 BC and 640 BC, and its capital Susa completely leveled. Ashurbanipal had promoted art and culture, and had a vast library of cuneiform tablets at Nineveh. However, his long struggle with Babylonia and Elam left Assyria maimed and exhausted. It had been drained of wealth and fighting population; the devastated provinces could yield nothing to supply the needs of the imperial exchequer, and it was difficult to find sufficient troops to garrison the conquered populations. Assyria, therefore, was ill-prepared to face the hordes of Scythians and Medes who now began to harass the frontiers to the east; Asia Minor too was infested by the Cimmerians. Upon Ashurbanipal's death in 627 BC, the empire began to disintegrate rapidly. The Scythians, Cimmerians and Medes immediately penetrated the borders, marauding as far as Egypt, while Babylonia again became independent; Ashurbanipal's successor, Ashur-etil-ilani, seems to have exercised little real power. The Babylonian king Nabopolassar, along with Cyaxares the Mede, finally destroyed Nineveh in 612 BC, and Assyria fell. A general called Ashur-uballit II, with military support from the Egyptian Pharaoh Necho II, held out as a remnant of Assyrian power at Harran until 609 BC, after which Assyria ceased to exist as an independent nation. The ancient people of Assyria spoke an Assyrian dialect of the Akkadian language, a branch of the Semitic languages. The first inscriptions, called Old Assyrian (OA), were made in the Old Assyrian period. In the Neo-Assyrian period the everyday language of Assyria was strongly influenced by the Aramaic language. The ancient Assyrians also used the Sumerian language in their literature. Assyrian art preserved to the present day predominantly dates to the Neo-Assyrian period. Art depicting battle scenes, and occasionally the impaling of whole villages in gory detail, was intended to show the power of the emperor, and was generally made for propaganda purposes. These stone reliefs lined the walls in the royal palaces where foreigners were received by the king. Other stone reliefs depict the king with different deities and conducting religious ceremonies. A lot of stone reliefs were discovered in the royal palaces at Nimrud (Kalhu) and Khorsabad (Dur-Sharrukin). A rare discovery of metal plates belonging to wooden doors was made at Balawat (Imgur-Enlil). Assyrian sculpture reached a high level of refinement in the Neo-Assyrian period. 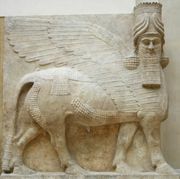 One prominent example is the winged bull Lamassi, or shedu that guard the entrances to the king's court. These were apotropaic meaning they were intended to ward off evil. C. W. Ceram states in The March of Archaeology that lamassi were typically sculpted with five legs so that four legs were always visible, whether the image were viewed frontally or in profile. Since works of precious gems and metals usually do not survive the ravages of time, we are lucky to have some fine pieces of Assyrian jewelry. These were found in royal tombs at Nimrud. There is ongoing discussion among academics over the nature of the Nimrud lens, a piece of rock crystal unearthed by Austen Henry Layard in 1850, in the Nimrud palace complex in northern Iraq. A small minority believe that it is evidence for the existence of ancient Assyrian telescopes, which could explain the great accuracy of Assyrian astronomy.